This paper is a comparative analysis of the British campaign in Mesopotamia during the First World War, 1914-18 and the current campaign in Iraq, 2003-4. The study focuses on an examination of Phase III decisive operations and Phase IV reconstruction operations, including strategic imperatives, operational planning, and the impact of changes during operations. The British had no campaign plan for Mesopotamia upon the outbreak of war in 1914. Deployment to this theater began as a peripheral operation. Overriding politico-strategic requirements spurred further exploitation to reach Baghdad. Failure to match ends and means resulted in the disastrous surrender of a division at Kut on 29 April 1916. Sweeping reorganization and large-scale reinforcements resumed the advance; Baghdad fell on 11 March 1917. The British conducted ad-hoc reconstruction operations throughout this period, beginning in the Basra vilayet and expanding their scope with the capture of Baghdad. The British established viable civil institutions, to include police forces, a functioning legal system, Revenue and Customs Departments, a banking system, and even domestic mail. Conversely, the recent U.S. strategy of pre-emption in Iraq was a policy decision based upon the wider strategic perspective and benefited from exhaustive operational planning. However, the rolling start campaign utilized minimal forces. They had the capability to win the decisive operations phase rapidly, but this same troop level was woefully inadequate to conduct incompletely-planned, sorely under-estimated, post-conflict operations. Both campaigns suffered from a serious mismatch of ends and means at certain stages, especially for post-war reconstruction operations. They achieved significant success due to herculean efforts in theater. The study concludes with recommendations for strategic leaders related to planning and force structure. Major Thomas E. Walton Sr. 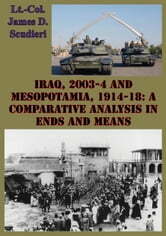 The British Experience In Iraq From 1914-1926: What Wisdom Can The United States Draw From Its Experience? United States Army Special Forces In DESERT SHIELD/ DESERT STORM: How Significant An Impact?